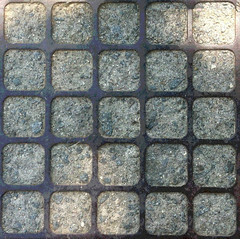 Square Grate Pattern, a photo by randubnick on Flickr. Tonight I used Painter 12 to create a pattern from my posterized photo of a square grate. (This is a kind of "found art" transformed into a digital pattern.) After I had "captured" the pattern, I started a new image and used the paint bucket to fill the new image with this pattern. Then I cropped the result for symmetry. I may try to see what I can do with this pattern on Zazzle. Square Grate (Posterized), a photo by randubnick on Flickr. 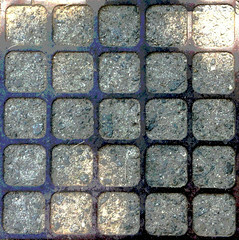 This is a posterized version of the image I posted yesterday, just a photo of a square grate made of concrete and metal. I liked the sunlight playing on the geometric shapes. Posterizing (with Painter 12) brought out the purples and greens. I think this has potential as a digital pattern. Square Grate, a photo by randubnick on Flickr. Last week, I was sitting on a bench at the Cummings Center Pond and noticed this grate made of metal and concrete. I really liked the pattern of rounded squares so I took a picture. It seems crazy to take a picture of the ground when the beautiful pond is right there, but I thought I might be able to do something with this bit of "found art". When I got the photo into the computer, I could see bits of dry grass and other distracting litter, so tonight I started by cleaning up the image a bit with some cut and paste and digital pastel. I also created a posterized version tonight, and I began to think this idea might have potential. More to come. Sun Breaking Through Clouds (Colorado Springs), a photo by randubnick on Flickr. Colorado has been on my mind because of the wildfires. Today I was looking at pictures of my home state, and came across a nice view of the mountains in a photo that I took in Colorado Springs during my last trip home. 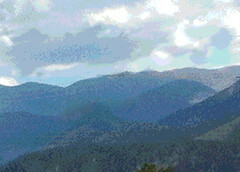 The mountains looked great in the original photo -- no fire, no smoke, just patches of blue sky and sun breaking through clouds. Although I liked the original photo, I had never used it because there were signs and electric wires getting in the way of the view. So tonight I used Painter to get rid of the wires with some cut-and-paste and digital chalk, and then posterized the image. Here's hoping for bright days ahead for Colorado. Pale Pink Roses (Digital Woodcut), a photo by randubnick on Flickr. Yesterday I used Painter 12 to add a woodcut effect to my photo of pale pink roses. I tried many versions, experimenting with the heaviness setting and the black line width. This was the best of many, many tries. I am still not quite sure of it. But this is what I worked on, so here it is. Pale Pink Roses (Posterized Photo), a photo by randubnick on Flickr. Tonight I used Painter to create this image. 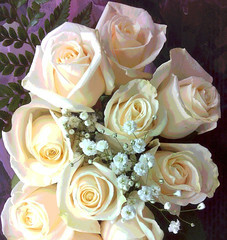 This is a posterized version of the photograph I published here last night, pale pink roses for a birthday bouquet. Pale Pink Roses, a photo by randubnick on Flickr. I was looking at roses today, picking out a birthday bouquet, and this one caught my eye. I liked the color, a very creamy pale pink. I liked them so much that I took a quick picture before I bought them. Tonight I used iPhoto to do some basic editing and then cropped the image to get this composition. 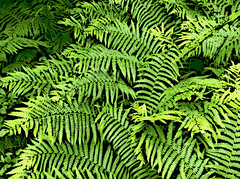 Ferns at Bradley Palmer (Digital Woodcut), a photo by randubnick on Flickr. This is the same photo that I published here last night (ferns at Bradley Palmer State Park), but I used Painter 12 to apply the woodcut effect. I wanted to see if the black outline would enhance the patterns of the leaves. I also created a version that is lightly posterized, but it is so close to the original photo that I decided not to post it here. However, I might upload it to Zazzle and see what I can do with it. Ferns at Bradley Palmer (Digitally Edited Photo), a photo by randubnick on Flickr. About a week and a half ago (June 12), we stopped at Bradley Palmer State Park, on the way home from the vet. There was a lot to see, but I really liked the patterns and lines in these ferns, so I took some pictures. This image had the best composition, right out of my iPhone camera. But it needed a little clean up (a few dried leaves, etc. ), so I opened the image in Painter and used digital pastel to make these problems less visible. While I had Painter open, I also created a posterized version and a woodcut version, which I plan to post here over the next few days. Colorado Drawings at Open Studios, a photo by randubnick on Flickr. 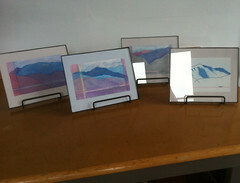 Last week, for open studios at Porter Mill, I framed up four Colorado drawings. (This is a new series of multimedia drawings created from an old sketchbook from a trip to my home state in the 1980s.) I was running out of wall space, so I put them in four small easels on the work counter. It was interesting to see how they looked when they were displayed together. Aspen (Framed), a photo by randubnick on Flickr. 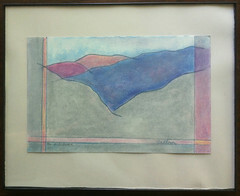 Here's one more of my Colorado drawings, framed up for Porter Mill open studios last weekend. This one is a drawing of Aspen, based on a pencil sketch from a small sketchbook that I used during a trip to my home state in the 1980s. I have been scanning, copying, and tracing the sketches so that i can then draw into the image with colored pencil, fine line marker, and colored chalk and conte crayon. Dillon (Framed), a photo by randubnick on Flickr. This mixed media drawing is based on a sketch that I made near Dillon, Colorado, during a trip through the mountains in the 1980s. I have been making copies of the sketches and then adding color with markers, colored conte crayon, and pastel. 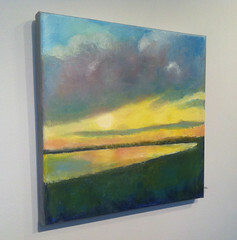 Last week I put them in frames for open studios at Porter Mill, here in Beverly, MA. 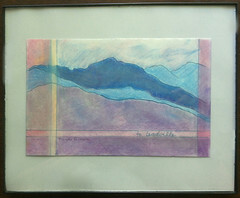 To Leadville (Framed Drawing), a photo by randubnick on Flickr. Dad and Me (Digitally Edited and Posterized Family Photo), a photo by randubnick on Flickr. Yesterday I was looking for pictures of my dad for a Father's Day project. I was rifling through albums trying to find one of my favorite old photos, and then realized I was looking right at it, in a little plastic cube frame displayed on the shelf where I keep my albums. 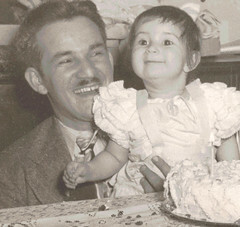 This is a photo of my dad with me on my birthday. The picture was taken by my uncle, Isaac Fitterman, a very talented photographer (professional name Jay Phillips) who took many great photos of the whole family! Well, this particular copy in the cube frame was much loved, and as a result was was much loved and the copy in the cube frame was worn, bent, and cracked. No doubt there is another copy somewhere (and I probably have the negative) but I decided to use this one. So I scanned it into my computer as a color photo, and used iPhoto's retouch tool to take out the worst of the cracks and marks. Then I used Painter to posterize it, which created the pink and green tones, and added a little sparkle to my ruffled blouse. Then I cropped it a little to get this composition. So this image is a collaboration with my Uncle Ike (who was a wonderful uncle to me), and a way to spend a little time thinking about my dad on Father's Day. Sunset Celebration (In Porter Mill Gallery), a photo by randubnick on Flickr. This is one of my oil bar paintings, and it is currently hanging in the Porter Mill Gallery. As part of open studios, every artist has a chance to display art work in the gallery, and this is the painting I submitted. I liked what the gallery lighting did for this painting, so while I was at the reception tonight, I took a quick picture. Lots of Strawberries, a photo by randubnick on Flickr. Yesterday's post was a digital sketch of strawberries that I created using Painter 12. 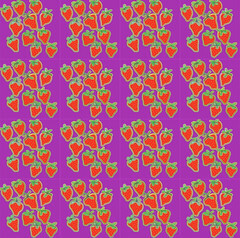 I also created a pattern from my strawberry sketch, and then used the pattern to create this image. It might be fun to use this pattern to make things on Zazzle. Digital Strawberries, a photo by randubnick on Flickr. Last week I picked some strawberries and it really makes you understand that one of the functions of color is to help us eat! If you want to find strawberries, you have to look for flashes of red among the green leaves. And if you want to tell if the strawberries are ripe, you have to look for bright red throughout the fruit. So color is necessary and delicious! 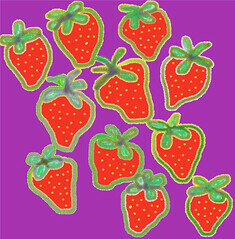 Tonight I used Painter 12 to create this digital sketch of strawberries. I also used this sketch to create a pattern, which I plan to post here tomorrow. 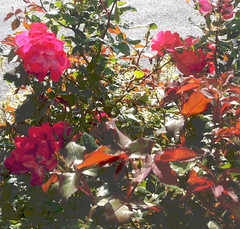 Red Roses in the Shade (Posterized Photo), a photo by randubnick on Flickr. The other day, during a walk at the Cummings Center Pond, I took some pictures of some bright red roses growing under a tree. They looked great in the afternoon light. But I didn't like the cluttered background. Tonight I used Painter to do some digital cut and paste on the background, and then posterized the image. I still wasn't happy with it, so I transferred in into iPhoto and cropped out the background, leaving this close-in view. Clematis on the Fence (Digital Woodcut), a photo by randubnick on Flickr. Tonight I used Painter 12 to create this digital woodcut from yesterday's post, my photo of purple clematis on a chain-link fence. I knew I would have to use trial and error to get the right amount of black line. But I kept losing the rich purple color. So I created a color set from the original image, and then used that color set to make the woodcut. It worked! 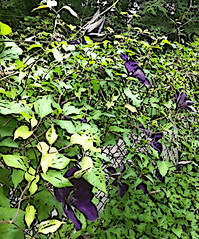 Clematis on the Fence, a photo by randubnick on Flickr. Today I was doing yard work when I saw the clematis in bloom on the chain link fence. They looked so good that I stopped and took a few pictures. This is one of the best. Tonight I cropped the original in iPhoto to get this composition. Colorado Drawings "Aspen Again", a photo by randubnick on Flickr. 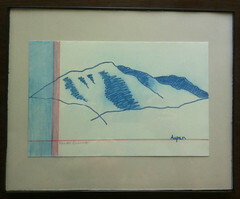 This drawing is based on a little sketch somewhere near Aspen, back in the 80's. It is part of a series of drawings based on a small (5"x 8") sketchbook that I took with me on a trip home to Colorado during the 1980s. I was drawing from the passenger seat of a moving car, just trying to capture the lines of the mountains, and sometimes I wrote down the location, as in this one. For this series, I am scanning the sketches into my computer and printing out copies which I then use to trace into a new sketchbook. (I put the print-out copy over graphite paper and trace over the lines.) The original sketch is posted here on April 25th. This is my second attempt at a drawing based on the Aspen sketch. (The first one was posted here on May 3). As with the earlier attempt, the color scheme for this drawing is inspired by the accidental inspiration of a printer malfunction when I printed out the copy for tracing. The printer heads weren't working and instead of black and white, I got turquoise and white, with faint red lines. (See post for April 27th.) For this second version, I wanted to maintain the accidental color scheme of turquoise and red, but this time I left more white area so as to give more emphasis to the lines of the mountains. If you want to see other drawings in this series, search my posts for "Colorado Drawings" and "Colorado Sketchbook". Bright Azaleas (Digital Woodcut), a photo by randubnick on Flickr. Last night I used Painter 12 to create this digital woodcut version of my photo of bright pink azaleas, posted here a few days ago. I fiddled with the controls to get the amount of black line that I wanted. Bright Azaleas (Posterized Photograph), a photo by randubnick on Flickr. 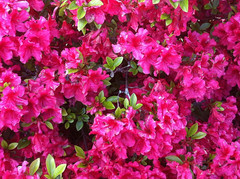 Two days ago, I posted a photo of bright pink azaleas, taken May 20th at the Cummings Center Pond. Tonight I used Painter to do a little digital cleanup and the apply a posterized effect to the photo, and here it is. I also created a version with a digital woodcut effect, and plan to post it soon. 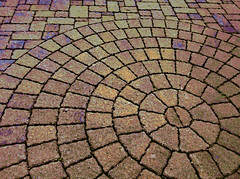 Stone Spiral (Digital Woodcut), a photo by randubnick on Flickr. Bright Azaleas, a photo by randubnick on Flickr. This is a photo that I took back on May 20, bright azaleas in bloom at the Cummings Center Pond, here in Beverly, MA. This is the image just as it came out of my iPhone camera. Chicken Collage Day 23 (June 5, 2012), a photo by randubnick on Flickr. Lately, I have seen a lot of birds: chickens at Green Meadows Farm, guinea hens at Long Hill Gardens, and this morning, two big wild turkeys walking around on the lawn across the street. I took this as a cosmic reminder that it was time to work on my chicken collage, so I went up to the studio this afternoon. 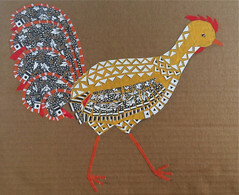 I am making a chicken out of patterns cut out of paper, and although the idea came to me all of a sudden while I was looking at some chickens, it is taking a while to finish it (my usual pattern with collage). Today I worked on filling in black and white pattern in the tail feathers. Cutting and fitting the tiny pieces is a lot like working on a miniature jig-saw puzzle. The work is tedious and it's hard to see progress, but I really like the way this collage turning out, so I am going to stick with it. Purple Violas at Green Meadows Farm, a photo by randubnick on Flickr. Another photo of a window box that I was admiring at Green Meadows Farm last week. 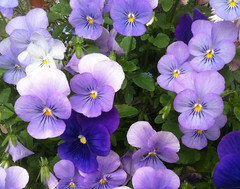 I am always surprised to see violas, and they always look surprised to see me! Tonight I cropped this image in iPhoto, and then did a little cleanup with digital pastel in Painter 12. Necklace with Wood, Reed, and Bells, a photo by randubnick on Flickr. 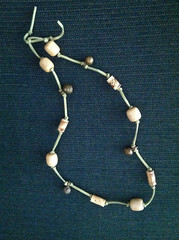 My break today was creating this necklace out of wooden beads, incised reed, and antique coiled metal bells. I put the design together on a soft green suede cord, using knots as part of the design. It's fun to wear because the bells make gentle music when you move. 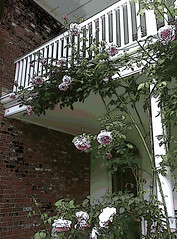 Climbing Rose at Long Hill (Digital Woodcut), a photo by randubnick on Flickr. Yesterday's post was a photo I took of these climbing roses at Long Hill Gardens, here in Beverly, MA. Today's post is a "digital woodcut" that I created from that photo, using Painter 12. I had to experiment with the settings to get what I wanted. I also used the "magic wand" selection tool to make the woodcut effect heavier on the brick wall, but using a lighter touch on the roses. Climbing Roses at Long Hill, a photo by randubnick on Flickr. This is a photo that I took today at Long Hill Gardens, here in Beverly, MA. (This used to be a private estate, but now the house and grounds are owned by the Trustees of the Reservation.) As usually, I didn't think there was time for a walk at Long Hill: tight schedule, too much to do. I have learned that when I am thinking that way, it's a sure sign that I need a break! I am glad I went to Long Hill today because the weather was lovely and lots of flowers are blooming, especially roses. I saw these pink roses climbing up a little balcony, so I took a picture. I liked way the roses look against contrasting textures and patterns. Tonight I also used Painter 12 to create a version with a woodcut effect; I plan to post it here tomorrow.